Some medical practitioners will say that Psoriasis is incurable. Alternative doctors would say that there is a way to control or eliminate psoriasis. 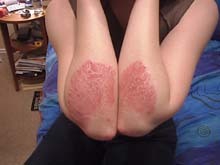 I say, while there is a flicker of hope, why not try the alternative method for psoriasis treatment? When I read their study, it made sense to me. 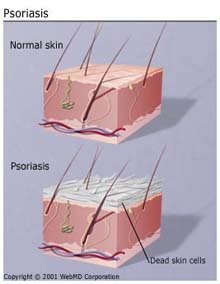 Psoriasis is a chronic inflammatory disease of the skin characterized by constant scaling, itching and bleeding. Alternative medicine would tell us that we have to go deeper than skin deep. The real cause of psoriasis according to them is the leaking of the toxins from the intestinal walls which have become thinner. The toxins runs havoc through the body systems excreting toxins through the largest organ of the body which is the skin. Thus the scaling, bleeding and itching. So, in order to address this problem, psoriatic patients must make a major clean up with their digestive system and improve their diets. For internal cleansing, water is the perennial advice by most alternative doctors. This is to help clear out the toxins out of your body by drinking more than 8 glasses a day. To stimulate bowel movements, stewed fruits are recommended like figs, apples, and raisins. To stimulate the internal organs by increasing circulation and blood oxygenation, exercise is recommended. A daily 30 to 40 minutes aerobics like walking, biking and swimming will be beneficial for this purpose. To help moisturize the dry and scaly skin, castor oil is recommended. Or you may opt to mix one part olive oil and one part peanut oil for thinner lesions without further irritating them. It is normal for the body to undergo a healing crisis when toxins are being excreted. This is the time when skin sheds off and there is intense itching. It is recommended that during this period, patients may take a warm bath with apple cider vinegar if the skin is not yet cracked from scratching.Add 1 cup rolled oats and cornstarch plus a pound of baking soda. This becomes an alkaline solution that’s good for soothing the nerve endings. You see, there is always hope. For cases like this, it is important to share alternative cures to friends and associates who may be enduring the pain and the cost of medicines for ailments that are believed to be incurable by conventional medicine.